American Express and the Seattle Seahawks extended their exclusive multi-year sponsorship partnership benefiting card member 12s with one-of-a-kind fan experiences not available for fans of other NFL franchises. The rest of the 2016 football season looks promising for the team, local businesses and loyal fans. The Sports Techie community blog is excited to share this AMEX news with our readers and followers in the PNW, across the nation and around the world because I am part of 12s nation having grown up in Washington State a lifetime Hawks fan. 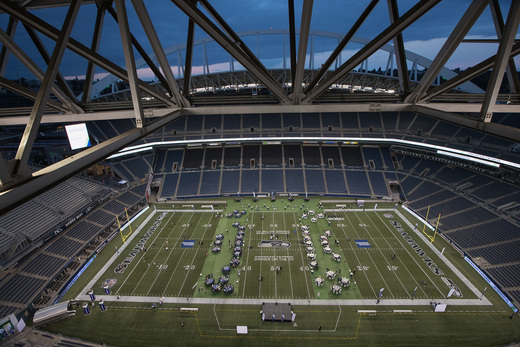 This is the second year of the arrangement and is significant because the Seahawks are the only NFL team Amex sponsors making tagline, ‘Back for the 12s,’ truly special. Sports tech makes the world go round. 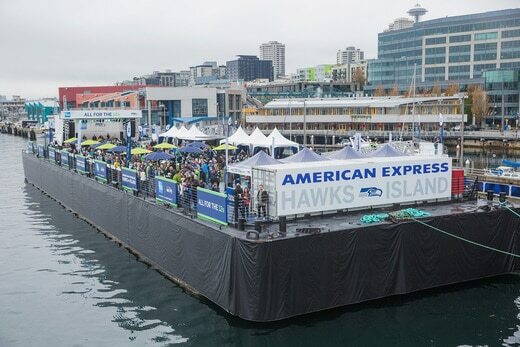 American Express will bring back Hawks Island to the 12s on October 16 prior to the Seahawks’ game against the Atlanta Falcons at CenturyLink Field. This 2016 regular season started off slow for the team but not the fans because a full lineup of activities for American Express Card Members and area merchants were already scheduled, win or lose. This home town mojo helped the mighty Seahawks right the ship and they are now in first place in the NFC West with a key matchup this Sunday at CenturyLink Field against the powerful Atlanta Falcons, also in first place in the NFC South. Program features include Hawks Island returning to a Puget Sound waterfront pier this Sunday, October 16. A rowdy but controlled Section 12 pre-game experience strategically positioned outside the stadium before home games. Also, fans were treated to a popular community tour featuring the American Express Fan Van and merchant tool kits allowing local businesses opportunities to create support of the team in 12thman style. American Express hosted the 2nd annual “Dinner on the 50,” exclusive dinner midfield experience for select Card Members highlighted by a royal four-course meal with seating on the 50-yard line. 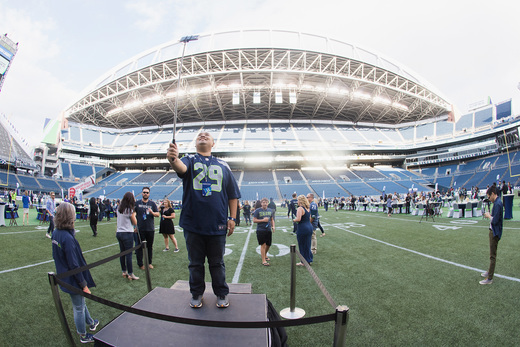 Attendees interacted with other 12s, took selfies on the turf, and enjoyed panel discussions with Seahawks players Earl Thomas, Bobby Wagner and Tyler Lockett, in addition to other memorable fan activities like bursting through the tunnel just like the team does during pregame. Exclusive Benefits for AMEX Card Members and Seahawks 12s. 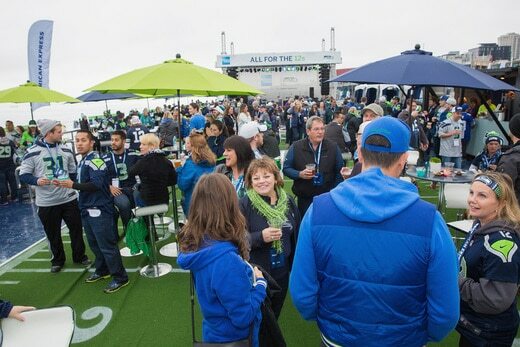 Section 12 Pre-Game Experience: American Express is bringing back Section 12 – a pre-game destination for 12s looking to congregate before Seahawks home games, located outside of the Northwest Gate at CenturyLink Field. The first Section 12 pre-game experience of the season took place prior to the Seahawks’ home opener. 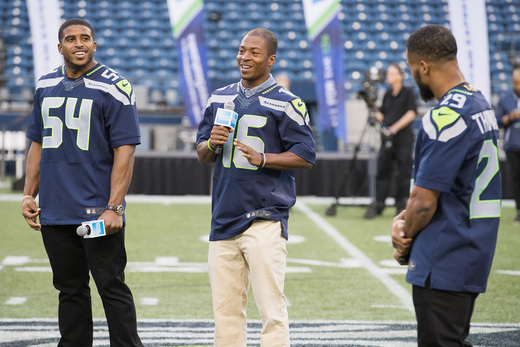 Fans will be treated to a variety of fan-friendly activities including appearances by Seahawks legends, giveaways, and phone charging stations. Event entry is free to American Express Card Members on a first-come, first-served basis. American Express Hawks Island: Following the success of its introduction last year, American Express will bring back Hawks Island to the 12s on October 16 prior to the Seahawks’ game later that day. 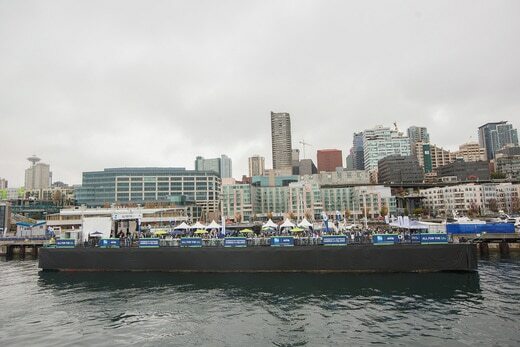 This exclusive Card Member experience, which takes place on a barge able to host hundreds of 12s on the Puget Sound, will include food and beverage from local Seattle merchants, Seahawks-related appearances and other special activities, combining to create the ultimate pre-game party! In-Stadium Perks: There will be a package of incentives for American Express Card Members making purchases in the stadium, including free gifts with concession stand purchases at select locations, Seahawks Pro Shop discounts during select games, and waived fees for the stadium’s mobile ordering feature. Stadium Experience Upgrades: At each Seahawks home game this season, American Express will surprise select Card Member season ticket holders with field passes to view pre-game festivities – getting fans even closer to the team they love! Amex 12s Pass: New this season, fans with iOS devices can add the Amex 12s Pass to their Apple® Wallets to receive notifications about exclusive Seahawks offers and experiences, including the chance to meet Seahawks legends, get discounts on Seahawks merchandise, receive exclusive game day benefits in stadium and more. AMEX “Dinner on the 50” event by American Express in partnership with the Seattle Seahawks, image via Mat Heyward / Getty Images for American Express. Tools for the 12s:American Express will enable local businesses to get even more involved with their fellow Seahawks fan base through customized “All for the 12s” item tool kits. Fan Van Community Tour:For those passionate fans across local Seattle area suburbs, a special Fan Van tour will bring the excitement of Seahawks player and talent appearances, giveaways and other opportunities. Sports Techie, by entering your americanexpress.com User ID and Password to confirm Card Member status you can download the Amex 12s Pass for the iPhone and iPad. Seahawks fans can use this Amex 12s Pass sports technology app for iOS to stay up to date on events and benefits all season long. 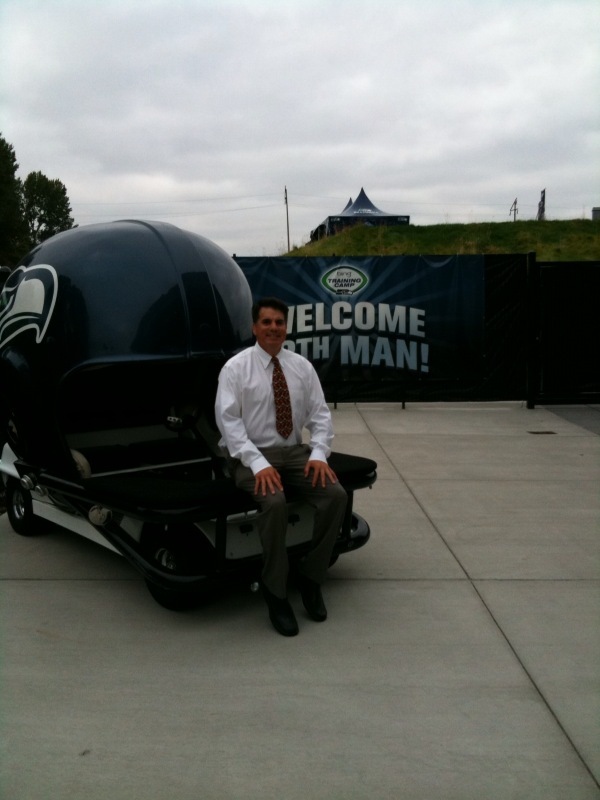 Sports Techie in golf cart at VMAC. The Seahawks are owned by Microsoft co-founder, local businessman, investor, philanthropist, and musician, Paul Allen. I worked on the Seattle stadium campaign team for Our Team Works and Mr. Allen, and I’ve seen him play electric guitar twice in person. Once at the campaign celebration for the passing of Referendum 48 enabling the facility to to be built as a competitive edge with the help of public funding while saving the Hawks from leaving to California. The other live entertainment experience was at the Seattle Center EMP when he got onstage with an all star rock-and-roll lineup and rocked the house. 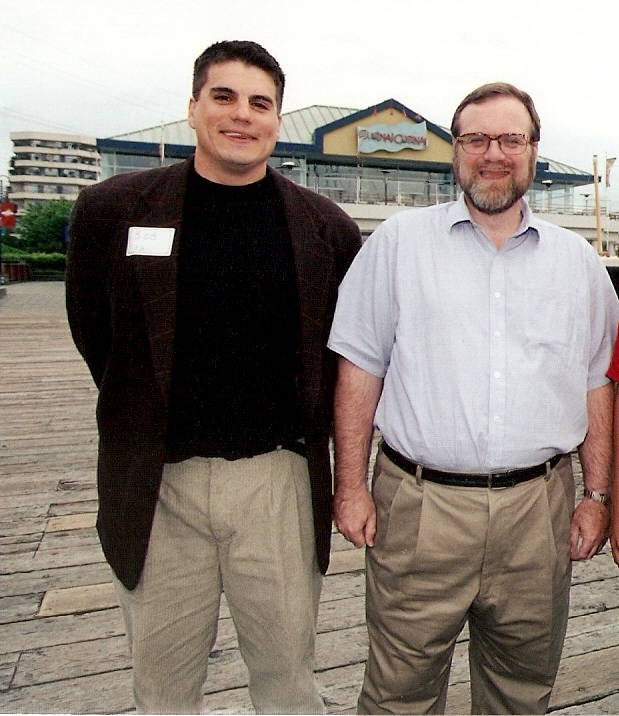 Microsoft cofounder Paul Allen and THE Sports Techie. I hope Paul reads this story and decides to join the band at Hawks Island before the upcoming game against the Falcons this Sunday which is sure to be closely contested. That way, AMEX card member can add another epic sport fan experience highlight to the list of specially created fun by American Express designed, all for the 12s.